Site of Wood Street Congregational Church On this site stood the Wood Street Congregational Church founded in 1868 by the Rev. William Watkiss (1827-1892) in a short-lived Temperance Hall which has become a music hall and circus. During his ministry and that of his successor, the Rev. W. Spurgeon it was extended to become the largest Congregational church building in Great Britain seating 3000. The final service was held in November 1971. 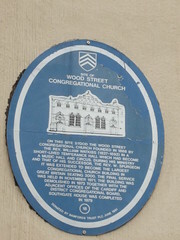 The building was demolished in 1973 together with the adjacent offices of the Cardiff and District Congregational Board. Southgate House was completed in 1979.